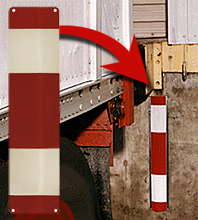 Dock Equipment > Dock Reflectors > Dock Reflector - Red/White, 5" x 30"
Dock Reflector - Red/White, 5" x 30"
When ordering, consider alternating colors if purchasing for several loading docks. Doing this will further aid drivers when they can see that the dock they are pulling into has yellow reflectors, whereas the docks on each side are marked with red or red/white reflectors. Utilize a wall anchoring tool to "shoot" anchors into dock sidewall using holes in corners of reflector as anchor points. Lacking a concrete anchor tool, use 1" plastic screw anchors with screws, drill with 1/4" drill bit, scribe, ruler, level, and screw driver. 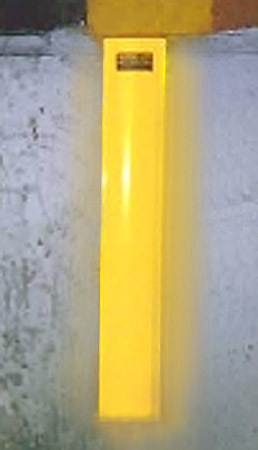 The reflectors should be vertically mounted approximately 2" below the rubber bumpers, but should be adjusted to avoid contact with the drive. Drill one of the top holes first and mount in place. Leave this screw loose so as to allow vertical and plumb adjustments prior to tightening. Drill the remaining holes, then tighten all screws.